The Space & Rocket Center in Huntsville, Alabama is raising money to fund an exhibition of the Shuttle Training Aircraft, a modified Gulfstream jet that was used to simulate Shuttle landings. Sometimes, a street race ends with both drivers crashing. A Tuscaloosa driver allegedly took things a step further by shooting his rival racer following their crash. This is the Kia Stinger concept in white, red, and blue. There's something about the vehicles from Jurassic Park that makes fans want to replicate them. 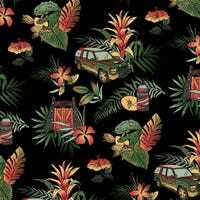 Here are all the Jurassic Park liveried vehicles I could find around the web. "SOME POS STOLE THE CADILLAC CONVERTER"
See Craigslist ad. Where on the car would you find this mysterious Cadillac converter (CadillacConverter™, perhaps? ), and what might it look like? The Economist's Democracy in America blog published an article yesterday that discusses Oregon's proposed vehicle-miles-travelled (VMT) tax, which is intended to enter a trial phase in 2015. It is an interesting concept, and I was curious how it compares to the current model. I was looking for engines on Craigslist and ran across this ad for a "small rocket engine test stand." Rockets are not an uncommon sight in Huntsville (see below), but this is still not a typical Craigslist find. On my way to work this morning, I saw a silver 535 with the pictured license plate. Based on how the car was driving, I think the driver was an asshat. What do you all think? This is my entry for the track contest, a rally course located on Isla Nublar, the site of Jurassic Park. I'm adding it here so that I can tag spots on the map with photos in the comment section. I just got back from changing the transmission fluid in my car at the Automotive Skills Center, which is located on the military base where I work. It was my first time to use the shop, and I was really impressed. 1999 BMW Z3 Roadster: Will It Kayak? Roadsters aren't supposed to be practical. They have two seats, hardly any spare room, and a soft top. That shouldn't stop you from using one to transport a 17 foot kayak, though. I'm sure you're all familiar with the way that Kinja crops leading images larger than 970 x 546. I got tired of manually editing the image's URL to view it full-size, so I made a Chrome extension to automate the process. My partner asked for this bumper sticker for her birthday. If I ever build a rally car, I'm definitely going to put these on the mudflaps. They would also be great for mobile libraries. I couldn't get a picture, but I just saw a woman driving a Tahoe with a green parrot perched on her shoulder. She did not appear to be a pirate. I could never find a replacement knob for my headlight switch (or it was only sold in conjunction with the entire switch unit), so I had one 3D printed. This might be a good option for anyone else having a hard time finding the right replacement part.